Training courses and online learning workshops are delivered throughout the year on various AAC related and wider Assistive Technology topics for teachers and other professionals and family members, as well as providing tailor-made professional learning to your site. CALL delivers regular short (approx. 30 minutes) free webinars on a range of topics, many of which relate to AAC. You can join these 'live' or replay them from the bank of archived Webinars. There will be Webinars on various AAC topics throughout 2017/18, all at 4pm (register in advance and check in a few minutes early, for tech checks). Check in with website for up to date details. 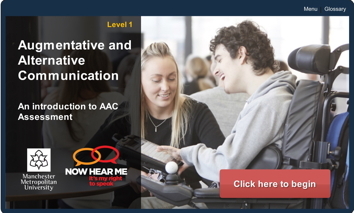 Level 1 and Level 2 Modules on AAC Assessment were produced by Manchester Metropolitan University, with support from NHS Education Scotland's Now Hear Me project. Module 1 helps people recognise the components of an AAC Assessment; recognise the role of their clients, families and other professionals; recognise techniques and roles within AAC Assessment; recognise when to seek support for an AAC Assessment and from whom. Module 2 consists of six chapters, looking at: people who might use AAC; understanding types of assessment; AAC assessment techniques; contributing to AAC assessment; access methods; measuring change. The modules contain lots of useful video material, but were created using Flash, which won't work on iPads and may require additional software for computer. 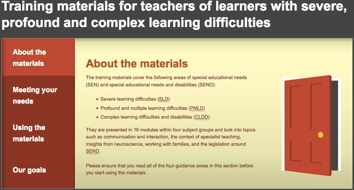 This is a Module in a collection of Training materials for teachers of learners with severe, profound and complex learning difficulties, originally produced by the Department of Education for England in 2012, but occasionally updated since then. The Module is broken down into 34 sub-topics, many of which having more than one slide. Video clips are embedded into some of the slides and there are links to other resources. This is the main module for people wanting to find out about AAC, but parts of the other 15 modules may also be of interest, so it is a good idea to have a look at the full list of modules included in the resource. This is an online webinar / module, free to view on Vimeo created and delivered by Rae Sonnenmeier Ph.D of the Institute of Disability, University of New Hampshire, USA. This presentation provides a useful summary of the key issues, covering: choosing appropriate messages; Core Vocabulary and Extended (Fringe) Vocabulary; language representation options; different symbol sets; organising vocabulary (activity grids, semantic / categories, syntactic, visual scenes). The presentation lasts approximately half an hour. 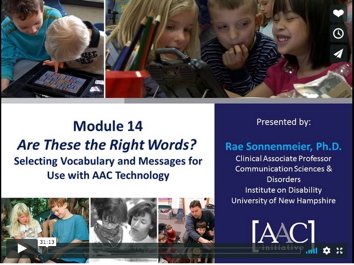 It is one of a series of webinars illustrating different aspects of AAC. You may like to explore one or more of a series of archived Webinars from the American AAC /educational materials company AbleNet, covering a range of AAC topics. Each of these is 40 - 60 minutes long. They use Flash so will not run on a tablet or phone unless a special App is downloaded first (e.g, Puffin for iPad). Learn more about Smartbox software - with a focus on the Grid 2 or 3 and grid set vocabularies - and hardware, through free online webinars, with staff on hand to answer questions and queries, as well as showing off tips and tricks. Talking Mats courses are delivered regularly in various locations around Scotland (and indeed, 'the world'). Training is available at Foundation and Advanced levels, and organisations can also organise bespoke training to meet their specific needs.Check the Talking Mats website for up to date details. Various training courses on aspects of AAC and /or Assistive Technology are available through ACE, either in Oxford, or - nearer for Scots - in Oldham. Check the website for up to date details. As part of work on the IPAACKS framework (Informing and Profiling AAC Knowledge and Skills) commissioned by NES as part of the 'A Right to Speak' initiative, Janet Scott of SCTCI has compiled (February 2014) a useful wider listing of possible AAC learning opportunities, although ongoing updating of this listing is not yet in place / assured.